"A little roller up along first�behind the bag�it gets through Buckner! Here comes Knight, and the Mets win it!" I don't know what's more alarming�the fact that it's been twenty years now since my Mets won the World Series, in the greatest October of my lifetime, or the fact that there's now more distance between today's Mets and the '86 world champs than there is between the '86 team and the Miracle Mets of 1969. The 1986 World Series was the nightmare matchup for George Steinbrenner, pitting his crosstown rivals against his divisional foes, and for that alone the Series was worth watching. It was also an epic battle, the stuff of opera, one for the ages�the Red Sox' own victory in 2004 may have taken the sting out of this for some of the New England faithful, but even coming back from down 0-3 against the Yankees cannot erase the stain of two decades of Bill Buckner jokes. This DVD set brings us every pitch, and then some. Actually, the set begins even before that. The first disc holds Game 6 of that year's National League Championship Series, with the Mets clinching the pennant against the Astros in extra innings, and avoiding a Game 7 matchup against Mike Scott, the MVP of the NLCS, one of the all-time great Pyrrhic victories, no doubt. Keith Jackson handles the play-by-play, with Tim McCarver as his color man; the game was played in the Astrodome, and the hash marks from Oilers' games are evident in every shot. Each of the next seven discs holds a World Series game, with the original NBC broadcasters, Vin Scully and Joe Garagiola. Bruce Hurst outduels Ron Darling in Game 1 for a 1-0 victory; Game 2 has the feel of a heavyweight bout, with Roger Clemens starting against Dwight Gooden, but it ended up a lopsided 9-3 Sox win. It's an opportunity to reflect on the pharmaceutical aspects of baseball�the players are all narrower than the swollen men on the field these days (less swollen this season, perhaps), and with hindsight, you can't help but reflect on how a potential Mets dynasty was undone by the battles with substance abuse of Darryl Strawberry and Gooden. Also, it's a chance to see Lenny Dykstra before he ballooned up like Popeye. The action switches to Fenway for Game 3, with Tip O'Neill throwing out the ceremonial first pitch, and one of my favorites, Oil Can Boyd, taking the loss in a 7-1 final in favor of the Mets. Gary Carter goes yard twice in Game 4�Mets 6, Red Sox 2�and Hurst goes the distance in Game 5, a 4-2 victory, Doc's second loss, leaving the Red Sox a victory away from glory. And then there is Game 6. All but forgotten are Clemens' strong seven innings, matched by Bob Ojeda, and Dave Henderson's home run in the top of the tenth seemed to seal the deal. But John McNamara, now residing next to Grady Little in Red Sox managerial ignominy, left a hobbling Buckner in at first, and the guys in the truck at NBC got ahead of themselves, naming Marty Barrett the player of the game, and flashing up all sorts of 1918 statistics. Bob Stanley's wild pitch allowed Kevin Mitchell to score and tie the game and Ray Knight to move to second, bringing Mookie Wilson to the plate. You gotta believe, especially watching Mookie's postgame interview with Marv Albert, who wears a frightening hairpiece and an electric pink sweater vest. Of course Wilson's grounder could have gone the way of Carlton Fisk's 1975 home run�a great moment in a losing cause�if the Mets had lost Game 7, but Sid Fernandez, certainly one of the more corpulent Mets ever to take the mound, saved Darling's hide, and Ray Knight did his thing on his way to Series MVP honors. They all look so young, and it feels like this wasn't all that long ago�but hope springs eternal in the summer game, and one of these years, the Braves are going to stop winning the National League East. Image Transfer Review: These original broadcasts look pretty badly faded and pock-marked�it's nice to have them on DVD, and it would surely be a waste to invest in restoring them, but it's a mark of how dramatically the technology of TV sports broadcasts has improved that these look ancient. Also, the Major League Baseball logo appears, annoyingly, in every frame, in the upper right corner. Audio Transfer Review: As with the video, it sounds like this stuff was sitting on a shelf somewhere for decades, which no doubt it was, giving us a lot of buzz and hiss. Extras Review: A bonus disc holds 22 clips and interviews (01h:23m:42s in all), featuring reminiscences from Dykstra, Keith Hernandez, Mitchell, Wilson, Knight, and of course Buckner. 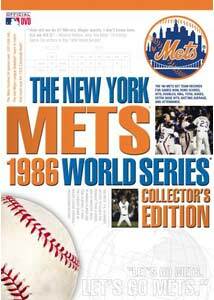 The legacy of the last is considered, but as this is a Mets package and not a Red Sox one, there's more time devoted to the Mets clinching the division (against the Cubs�sorry, dOc colleagues), more highlights from the 'Stros series, clubhouse celebrations, and the World Series ring ceremony in 1987. You've got to be some kind of serious Mets diehard to sit through twenty-two hours of baseball games played twenty years ago, but we know who we are, and we understand the glory of it all.